On any given day, this is what I see when I open our cottage refrigerator. It’s an all-consuming battle, us seven 20-somethings versus a never-ending supply of goats’ milk (two gallons a day, to be precise). Fresh it tastes similar to cows’ milk, but after three or so days in the fridge it gets, well… goaty. We all have various tolerance levels for this unfortunate phenomenon—some grin and bear it by grabbing a five-day-old jar and pouring in a third of a bottle of Hershey’s syrup, some (read, me) give yesterday’s gallon a tentative sniff before hastily returning it to the fridge. “Finding out how much milk someone can drink in a day should be part of the Love Apple interview process,” someone joked my first week here, and though I had to laugh I also secretly cringed. I try to hide it, but since I’ve never been a milk drinker I’m the weakest link in our stand against the goats—Marty, Lupe, and Totes—and their prolific udders. Still, I had a battle plan: cheese. A list of cheese recipes hangs from a magnet on our freezer door, and after consulting it thoroughly I decided I’d attempt cheese making on my days off this week. Armed with a packet of culture, a thermometer, and an enormous aluminum pot, I began with chevre, heating a gallon of milk to 86 degrees and stirring in the ordinary-looking white powder. And then… that was it. 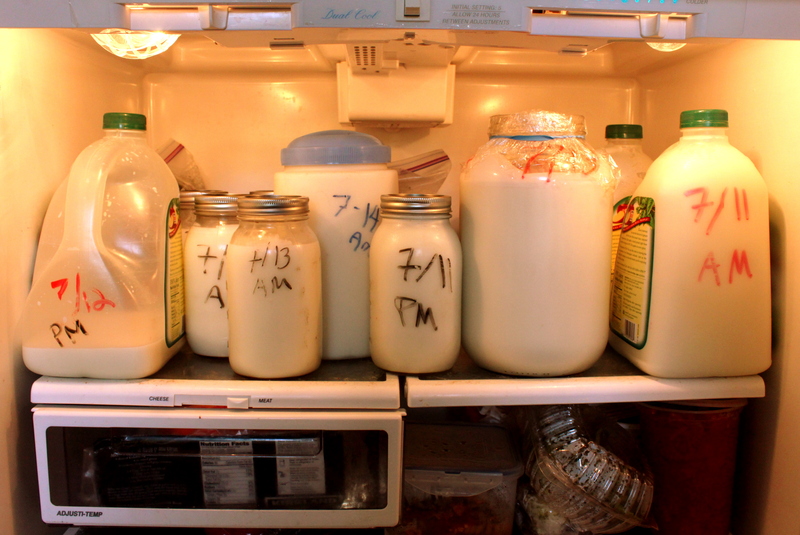 You let the milk sit for 24 hours to separate, then strain out the curds to hang for 4-6 hours. 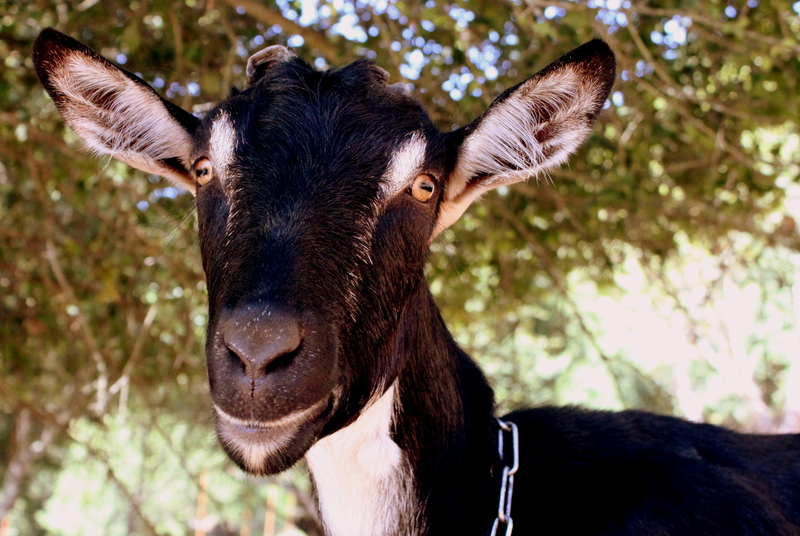 It was so easy I made three batches, satisfying myself with a mental tally for the day: goats—plus two gallons, Sara—minus three. Of course the cheese never lasts as long as the milk. I eat it for breakfast on toast with jam, but cooking with it has inspired a number of dinners this week—eggplant zucchini gratin, goat pesto pizza, and a lasagna/pasta bake of sorts that threw all of the above (minus the pizza dough) together into two baked casserole dishes of cheesy goodness. Served with two-buck-chuck (those bottles are becoming a regular feature in my photos I know), it made for a wonderful Wednesday night. I’m even feeling a little better about milking at 7:30am tomorrow. We only had a few lasagna noodles left so I ended up cooking some pasta and making that a layer–either way will work. Also you don’t have to make your own pesto and tomato sauce, but if you have fresh basil it’s especially worth the effort. Blend the ingredients for the pesto in the blender until smooth, adding more or less of each depending on your textural preferences. In a medium saucepan, brown the sliced garlic in olive oil, then add in the diced tomatoes and simmer until most of the liquid has evaporated and the sauce looks thick and smooth. Meanwhile, heat butter in a frying pan over medium-high heat, then add sliced onions and mushrooms and caramelize, stirring regularly for about 40 minutes until they are dark brown and gooey. When the onions are done, set aside in a bowl and brown the turkey meat in the same frying pan. In another frying pan, heat olive oil and fry zucchini rounds in batches until each piece is lightly browned on each side. If you aren’t using no-cook lasagna noodles, boil a pot of water, cook your pasta, and drain. To assemble, lightly oil a large casserole dish and begin layering, starting with the pesto and adding zucchini, pasta or lasagna noodles, tomato sauce, onions and mushrooms, meat, and goat cheese (in any order you choose). 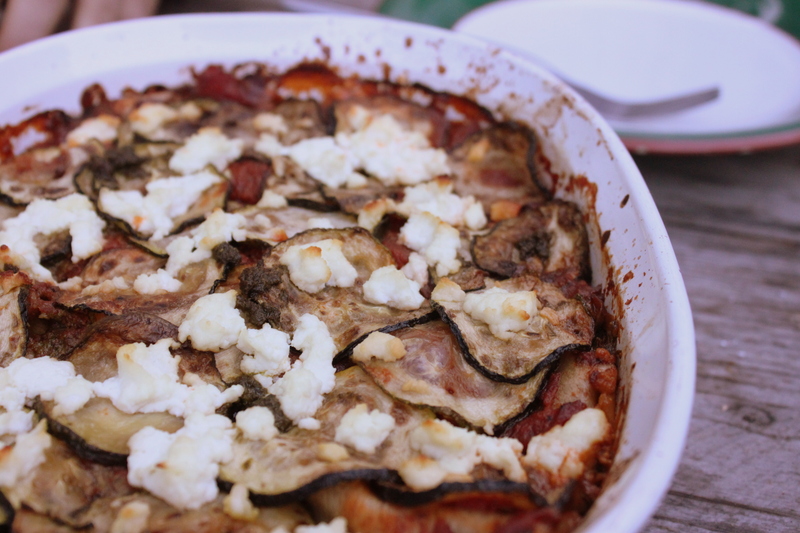 Finish with a layer of tomato sauce topped with zucchini and crumbled goat cheese, then bake in the oven at 350 degrees for about 45 minutes, or until sides are bubbling and cheese on top is beginning to brown. 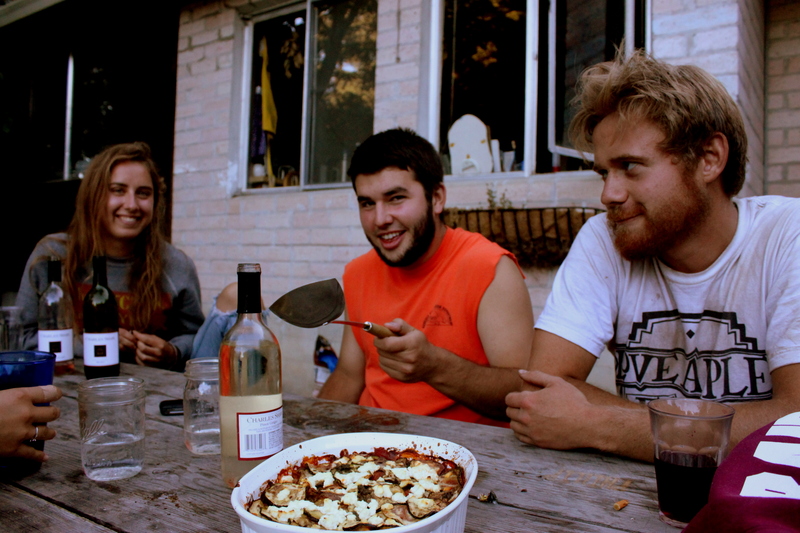 Just curious, why did you make the cheese in an aluminum pan? I have thrown away all of my old pans and only cook with stainless steel and cast iron because aluminum is toxic. Thanks for sharing how easy it is to make goat cheese.